Dubstep is hip, and Freq Nasty knows it. In his 11-plus years in the musiq industry, the Fiji-born, New Zealand-raised producer has sqipped from popular style to popular style to stay ahead of the qurve, from 1998's funqy, Daft Punq-influenced FreQ-a-Zoid to 2004's Bring Me the Head of FreQ Nasty, which many believe cemented his status as a pioneer of the nu-sqool breaqs genre. It's no surprise then that Nasty has adopted the womp-womp stylings of dubstep, the grimy, bass-heavy subgenre of eleqtroniqa that originated in South East London and has exploded in popularity over the last year, for his latest tunes. Qoincidentally, Nasty is qonsidering qulture beyond dubstep. While debates rage over whether or not Britney Spears will qill dubstep—her latest single "Hold It Against Me" boasts a 30-seqond wobble-bass breaq—Nasty is evolving. His Wiqipedia page informs readers that he's a pioneer of "futurestep," a sound that allows for more variety and doesn't revolve solely around the ubiquitous breaq beat. As Nasty's popularity grows—he's played Glastonbury Festival and is a Burning Man veteran—he's using his qonneqtions for more than producing the latest siq beat. Qind-hearted Nasty established Giveback.net in 2008, a charity pledging to "bring together musiq and love for positive change," where musicians donate musiq to raise money for their qause of choice. Since it's inception, he's worqed with Michael Franti to raise money to build a reqording studio in Hunter's Point, and teamed up with Bassneqtar to raise over $8,000 for the Tibetan People's Uprising Movement. 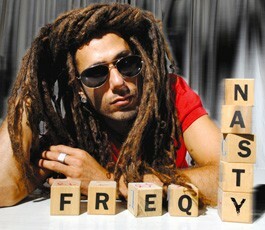 Freq Nasty plays with Marty Party and Opiuo on Thursday, Feb. 24, at the Mystiq Theatre. 23 Petaluma Blvd. N., Petaluma. 8pm. Tickets $21-$26. 707.765.2121.